When we headed out on holiday to Wales, we took a few toys with us – ones that would keep the boys occupied in the evenings. The Bob the Builder Mash and Mold Construction Site was top of our list – and I’m so glad we packed it because it was out at least 4 times during the week; even granny had a go [and so did I]. We took the new Scoop toy too, but Daddy and Grandad kept hijacking that. The set includes four hexagonal tiles which slot together like a jigsaw in any way you’d like. This is the work surface for Bob, on which you can use the 16 ounces of Mash & Mold sand. Whenever I read reviews I see measurements and have no clue, and so I’ll tell you that 16 oz of this sand is about as much as if you put both fists together. It hasn’t dried out at all and the boys have played for hours and hours with it so far, indoors and out. There are five tools and 35 molds of tools for creating and smashing bricks, and Bob’s toolkit! There’s a double sided Bob and Wendy which doubles as a footprint stamp [I liked this one], Tiny the Crane with his wrecking ball [a favourite with the boys] Dizzy the mixer, and a little machine – the blue, red, orange and yellow one, which makes bricks to build up and smash on the demolition pad. It’s brilliant fun, perfect for a rainy day now the Autumn is coming. That there is so much to do with the set – five of us played side by side without arguing over who needed which tool! How little assembly is needed, which is perfect for me. That the set is scaled for the figures to join in with for more imaginary play. How the sand has actually stayed moist and ready for reuse over and over. That there was more sand – or more sand obviously available. I did a quick search on Amazon as I generally do when searching for a toy and saw none. Researching which sand I need takes time, and most parents just give up and the toy ends up discarded or relegated to the garden/filled with PlayDoh. 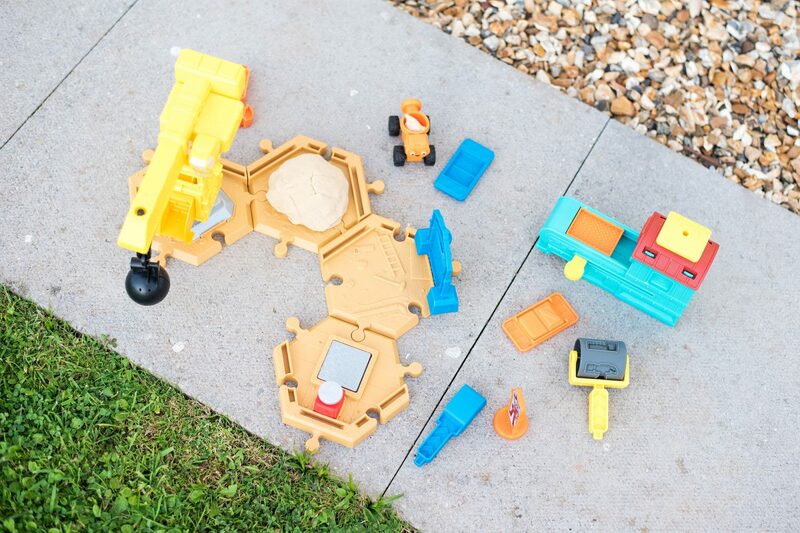 I would absolutely buy the Bob the Builder Mash and Mold Construction Site for my boys or as a gift. It provides hours of play, is non staining and easy to clear up. I felt as though I was getting value for money with all of the little pieces which are brilliantly detailed, and as I said above, five of us were able to play together. The only sticking point for me would be the sand issue – selling blocks of it next to the toy in the stores would be fantastic. I would pick up two or three with the toy, and be happy to buy more. 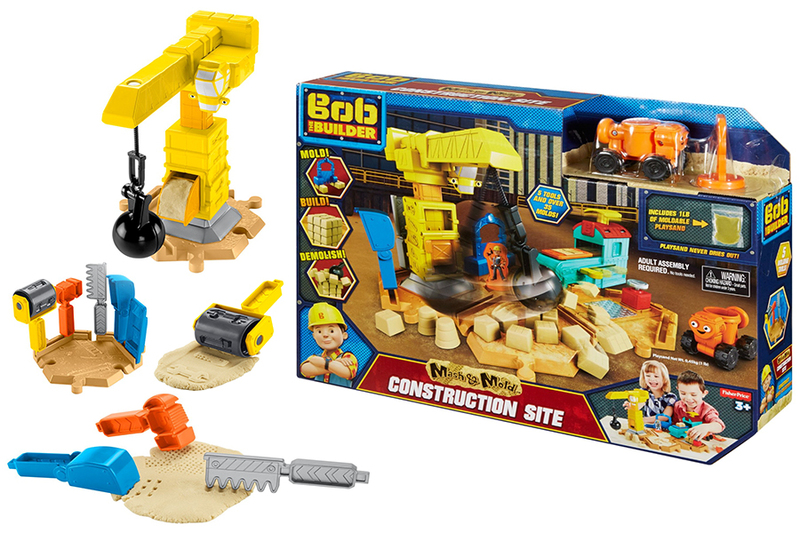 Bob the Builder Mash and Mold Construction Site Playset is available at around £24.99 in most toy stores. 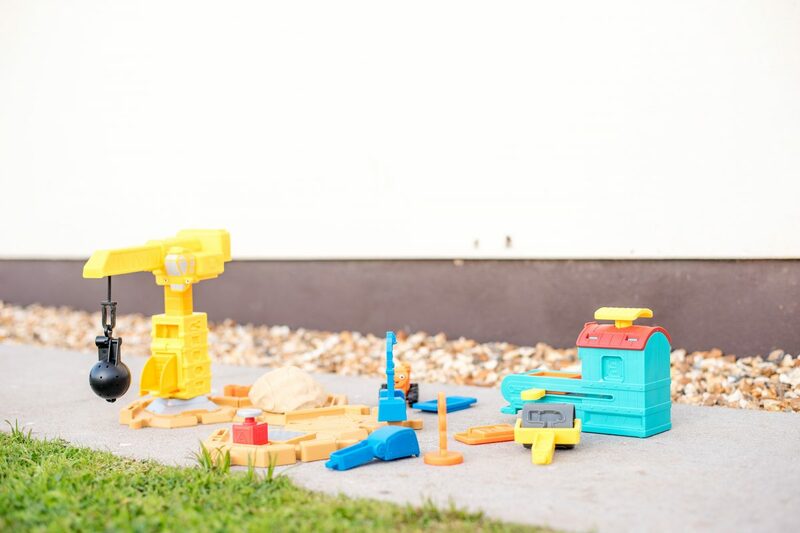 My son is a huge fan of construction toys, so will absolutely love this! Did you figure out what sand to use? Is it the new kinetic sand thing? I’m going to try the kinetic sand because it feels just like it, although not as stretchy, if you know what I mean. I’ll let you know when I figure it out! My son loves anything Bob. He would love this. What a great playset for a little one. My little man would love it. We really loved this playset. Looks like he is really loving it. This is fab! I love the different elements in it and different textured materials. It’s good to be able to build something at the same time as having mouldable items.